Since the day he left us, I have been longing for Kai to appear to me in a dream or vision and tell me how much fun he is having in heaven and how he is waiting for me and loves me. I just want to see and hear him, even if only in a dream. But this has not happened. I have a lovely young coworker who has experienced great personal tragedy of her own and who has been quietly sympathetic and supportive of me during this time. Yesterday she respectfully sent me an email letting me know that she had dreamed of Kai, who she never met, and asked if I would like for her to share with me what happened in her dream. Of course, I wanted to know. We were all at the picnic party, then I saw him riding the tea cups. He had on a polo shirt, brown and beige stripes, or brown and white, can’t remember. He had a big smile on his face and he looked at me and he told me to tell you: I’m ok where I am, I’m not scared, not afraid, I love you and I want you to be happy. He looked really happy in the dream, he was smiling all the time. Kai did have a brown and white striped polo shirt. We rode the tea cup ride at Disney World a little less than two months before he died. He loved that ride. The faster we spun, the more he laughed. He smiled the whole time we were on that ride. He smiled most of the time in life. I know he is smiling in heaven. I know he is happy and beautiful and bursting with life while he waits for us. 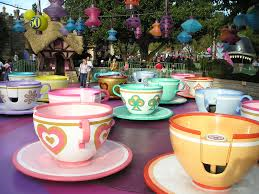 And riding the tea cups. Kai’s sheer joy and unfettered laughter, his shrieking with unmitigated delight on that ride in December captured such a beautiful part of the essence of his delightful spirit. I hold that memory so close to my heart and will never forget that he is even more joyful now, flying so high as he waits for us, heart bursting with elation and that huge, magnificent grin on his beautiful face.